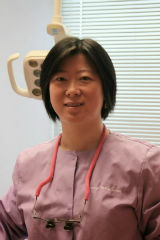 Dr. Li has been practicing dentistry since she graduated from dental school in China in 1996. She worked as a general dentist for four years in a community hospital before moving to U.S. At Buffalo, New York, she spent nine years on research and clinical study. She received intensive training on comprehensive dental treatment involving patient education, oral disease diagnosis, esthetic and functional teeth restorations. Her research has been published on oral biology research journals and presented at national and international conferences. After graduation in 2009, Dr. Li pursued her career in private and pediatric dental practice where she gains extensive experience on children and family dentistry. She loves seeing children at various ages from infants to teenages. She enjoys educating and helping them to establish a healthy oral habit at young age. Dr. Li is well respected by colleagues because of her fine skills and dedication to patient's care.﻿ Dr. Li takes numerous continuing education course to keep her updated with the newest technology﻿ in dental field. She names her practice Serenity Family Dental after her English name Serene. Her goal is to create a peaceful, relaxing dental environment and strive to make your dental visit a pleasant experience.